Great Smoky Mountains National Park is one of the most diverse national parks in the United States. There is always something to photograph no matter what kinds of conditions nature deals you. With high elevations, there are opportunities to photograph mountain peaks, amazing sunrises, and sometimes spring snow. With low elevations, there are plenty of trees, wildflowers, and waterfalls to shoot. Spring in Great Smoky Mountains National Park offers outdoor photographers a plethora of features that we will visit to create a well-rounded portfolio from the workshop. The workshop will have a strong emphasis on in-field work. The workshop focuses on understanding your camera’s settings in order to break into new creative realms. There is a strong emphasis on producing striking and powerful compositions, as well as telling a story with your photos. The workshop will cover shoot planning and how to be in the right place at the right time. Amazing Landscapes: The diversity and beauty of Great Smoky Mountains National Park in the spring is unrivaled. Small Group Size: The low participant to instructor ratio ensures plenty of 1-on-1 instruction. Getting There: Great Smoky Mountains National Park is located in Eastern Tennessee. There are a few airports such as Nashville, TN, Atlanta, GA, and Raleigh, NC, that will give you close access to the park. The closest airport is located in Knoxville, TN, however it is usually more expensive to fly into the Knoxville airport. Great Smoky Mountains National Park is typically accessed via I-40 and Gatlinburg, Tennessee. For our workshop, we will be based in the city of Townsend that is just outside of the eastern border of Great Smoky Mountains National Park. Townsend is a small country town with a few restaurants, hotels, and the best coffee shop on the planet. Day 1, Thursday: Participants arrive in Great Smoky Mountains National Park and are free to explore the park on their own. Before sunset we will meet to introduce the group, talk a bit about the workshop, and give a brief overview of The Smokies and its unique wonders. Then we’ll head out for our first sunset shoot. Day 2, Friday: Up early to catch the sunrise at Clingman’s Dome, followed by a morning shoot with the marvelous light and wildflower photography in the Sugarlands section of the park. Then we’ll take a break for lunch. We reconvene in the early afternoon to shoot the warm light mountain streams and waterfalls. An hour or so before sunset you’ll see the valley come alive as the low light from the setting sun creates a vivid display of golden light and spring blossoms. We’ll stay at the streams for sunset. Depending on the group’s energy level, we may talk a little about post-processing. Day 3, Saturday: Up early to catch the sunrise in Cades Cove. Cades Cove offers a huge mountain field surrounded by the old Smoky Mountains where morning light seems to linger and glow. After that, we’ll once again take a break for lunch and to recharge our batteries. There will be a short post-processing session, then we’ll head out to Morton’s Overlook to catch the sunset. After dinner, we will poll the group to determine if we will have another post-processing session or if we will get some rest and gear up for the last day of the workshop. Day 4, Sunday: We will wake up early again and head to the Greenbrier area of the park where there are opportunities to photograph intimate spring details and possible panoramas. After breakfast, we will return to our place of stay to check out and then have an optional final session as well as option photo critiques and question and answer session. This Great Smoky Mountains Spring Photography Workshop is organized to take advantage of the best and most interesting locations the park has to offer. However, the exact itinerary and places we visit may change depending on the group and weather conditions. Weather: Great Smoky Mountains National Park in the spring season has weather conditions that vary tremendously and can change quickly. Due to elevation changes and the photography opportunities in the park, we will be visiting warm valleys and frigid mountain tops. Spring is also prone to sporadic rain showers that pop up unexpectedly. It is for this reason that you should pack clothes to wear in layers for whatever conditions we will experience, as well as rain gear. Fitness Level: This Smoky Mountains workshop is appropriate for photographers of moderate fitness levels. We will walk approximately 5 miles over the course of each day of the workshop. This includes walking on wet, rough, and slippery terrain. Walking along mountain streams and mountain landscapes can be strenuous. All participants are expected to be able to carry their own camera, personal gear, and water during the workshop. $900 per person. Pay in full by clicking the ADD TO CART button below. A deposit of $300 is required to reserve your spot with the balance due 60 days prior to the start of the workshop. Reserve Your spot with only a deposit by clicking the ADD TO CART button below. Transportation - While participants must provide their own transportation, we will be car pooling as much as possible. Meals during the workshop - We will usually eat together as a group. 1-On-1 Instruction At Your Level: Photography is more about though, ideas, and technique than it is about copying a photo. This means that it doesn’t matter what level of photography you’re at, you can expect to come away from a workshop with new ideas about photography and how to improve your images through creative style, expression, and an understanding of your camera settings. My workshops are designed to help you nail shots in the field and then compliment them in post-processing. Not only that, but with a relaxed environment, you can soak up all of the information covered with as much 1-on-1 instruction as possible. My philosophy is that YOU need to become a better photographer. Small Class Size: Smaller classes are better because it insures that you are getting the most informative 1-on-1 instruction as possible. Smaller classes also tend to bond and share information more easily that larger groups. My Photography Philosophy: Photography is about fun. It’s about being outside and soaking in the sights, sounds, and feelings all around you. Photography is also more fun when you’re around other photographers who just “get it.” I try to create a fun environment where you can enjoy your time in the location, learn at your own pace, enjoy and appreciate nature, and have a great time while doing it. Never Stop Scouting: I love going to familiar photography locations and iconic places. However, I don’t do it to copy other people’s compositions or take the same photo over and over. I’m more interested in constantly scouting locations in order to photograph compelling angles and perspectives to make a classic location look unique. Fully Insured and Permitted, Leave No Trace Advocate: I take pains to ensure my activities are 100% above board. I obtain all the necessary permissions and insurances required in order conduct my workshops. I am also a strong advocate of Leave No Trace (LNT) wilderness ethics. I teach responsible photography practices and never sacrifice the environment for the sake of a photo. My goal is to leave my photography workshop locations in better shape than the way I found them. David Johnston is a landscape photographer living in Tennessee in the United States. He photographs nature and produces content for websites like Outdoor Photography Guide and Visual Wilderness. David helps people improve their landscape photography through online video. He runs his own YouTube channel, teaches photography workshops, and gives presentations on landscape photography. 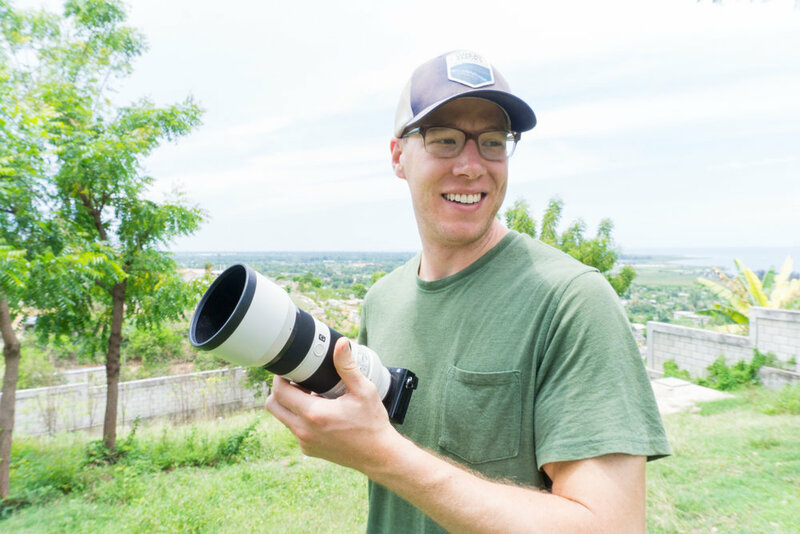 After several years of leading workshops, David has experience leading groups in Great Smoky Mountains National Park, Acadia National Park, Grand Tetons National Park, and Rocky Mountains National Park.